“Don’t waste your time in Kaili”, advised Wang Dewei, a retired English teacher who played erhu (two-stringed spike fiddle) with an amateur park choir. An accusation of laziness would have made me happier than his intended meaning, that my time was wasted because I had chosen the wrong place to do fieldwork on everyday musical activity. The city of Kaili was not the best for music and I should instead head to the surrounding countryside, Teacher Wang explained, as we walked through the park. International Labour Day holiday was less than a week away, and he felt that this would be a good opportunity for me to visit a nearby county town, where they would have festive activities. I asked if Kaili would not have similar activities. It would, he responded, but organized by the city government, whereas those in the county town would be organized by the ordinary people (lao baixing). By the time of this conversation, at the start of a second fieldwork trip to Kaili in Guizhou province in 2011, I was already somewhat accustomed to statements advising me to leave the city, such was the regularity of their occurrence. Accustomed, but still not entirely comfortable. It had become an unlikely repetition across the otherwise disparate spaces in which I did fieldwork, where people whose only immediately apparent commonality was a desire to usher me out of the city and into the rural counties. After identifying the consistent repetition of this advice – to leave one place and study another – I eventually asked, why do the inhabitants of Kaili consider their own city as musically without merit in comparison to the surrounding villages? This proved a fruitful research question. Here, I want to examine the somewhat painful process by which I came to this question. I first arrived in the small city of Kaili for a two-week reconnoitre in June 2010, on a mission to contribute to the ongoing problematization of the official system of minzu classification in China, that is, the classification of groups into categories once known as “nationalities” but more recently translated as “ethnicities” (see Bulag 2003: 760-2 on the translation of minzu). Of the various cultural practices often associated with minzu, I chose music on the basis of previous experience as a music journalist in Beijing, as well as an MA in ethnomusicology. I specifically intended to study cross-minzu musical interaction, in reaction to much of the PRC musicological literature, which depicted the musical practices of minorities as culturally bounded. 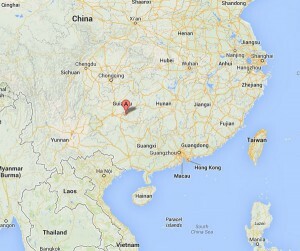 In order to select a suitable fieldwork site, I consulted population maps of China. I wanted a location that contained a good mixture of minzu. My then supervisor felt that it would be a waste of my relatively advanced Chinese ability to do fieldwork in a large city, and that English-language research on Chinese music was already partially skewed in that direction. Equally, I did not want to do research on a village, feeling there was as much of an over-emphasis on rural folk music as on metropolitan sub-cultures in the relevant literature. I had spent far more time in Chinese cities than villages, and wanted to build upon my accumulated experience of the urban, rather than sever myself from it. Consequently, it made sense to look for a small city. Kaili fitted the requirements, as a third-tier city in southwest China with sizeable populations of Han, Miao, and Dong minzu, as well as some smaller groups. Of equal importance, official local literature made frequent references to music, marketing Kaili as “the homeland of one hundred festivals” and “an ocean of song and dance”. Such slogans referred primarily to the practices of the Miao minzu, with the lusheng – a free reed instrument – proffered as the cultural marker of this minority. Imagining fieldwork in Kaili, I anticipated scenarios that offered clear contrasts between the exotic representations of mono-minzu folk music and the multi-minzu diversity of everyday music-making. The fact that the marketing literature was vague about the specific location of music in the city did not concern me; I was sure that there would be a great deal of music, just as I was sure that musical practices would cut across official minzu categories. However, as fieldwork drew nearer, I began to develop doubts about the city’s suitability. In preparation for my trip, I contacted bloggers who had spent time in Kaili, posted on a local forum, and talked to musicologists with knowledge of the city. I received many responses, but most were unenthusiastic about my chances of finding cross-minzu musical activity. One Chinese musicologist emphasized that Kaili was just “a Han city”. Another musicologist was scathing, asking why I would want to go there, and regarding Kaili as nothing more than part of an urban fabric that emanated from Guiyang, the provincial capital, some two hours away by train. An American volunteer at Kaili University e-mailed to tell me that he had been to many parks, squares and other public spaces, but had rarely seen musical performances. One internet forum respondent suggested I study the “Big Songs” of the Dong minority (Dongzu dage), but was not forthcoming when I pressed for details of where I could find such music in Kaili. Upon arriving in Kaili, I became increasingly worried that it lacked sufficient musical activity to make meaningful contrasts with the city marketing literature. I largely split my initial days between three separate groups: English-major students and their American teachers at Kaili University; a Kaili-born student of a coastal city university and her visiting classmates; and affluent young professionals. My hope was that these various contacts could help me locate musical activity. They did a lot more than that. Over the two weeks of my first visit, they certainly did introduce me to a number of music groups. However, these introductions were overshadowed by my acquaintances’ conceptualizations of Kaili and music. I was struck by the frequency of two interlinked statements: firstly, there was little music of interest in the city; and secondly, I should look for authentic music in the villages of wider Qiandongnan prefecture, of which Kaili is the capital. My first meeting with Lan Xunyi, a conservatoire-trained singer, can provide an example. Ringing her mobile on the third evening of my stay in Kaili, I ascertained that she was attending a gathering of family and friends in an upmarket restaurant close to my hotel. After inviting me along, Xunyi and her friend, Chen Xingqi, a Han businesswoman, wanted to know which minority’s music I intended to study, Dong or Miao. I responded that I hoped to do a multi-minzu study. This was dismissed – fairly aggressively – as an impossibility by Xingqi, I must choose one or the other. They both encouraged me to go out into the counties and study yuanshengtai, that is, the authentic cultural practices of minority villages. Despite being advised to focus on the villages, I continued to press for information about music in the city itself. Xunyi said that there were young people singing courting songs at night in the park by the old town, but I should not get there alone, as she considered the area somewhat disreputable (luanqi bazao). Besides, she told me, such activity was not indigenous to Kaili, it had been imported from the villages. She applied the same judgement to “performance-style” (biaoyanxing) music in song-and-dance restaurants; people tended not to visit those places any more, because of the trend towards yuanshengtai, preferring to go to the villages instead. I kept asking about the city; what about music in parks? 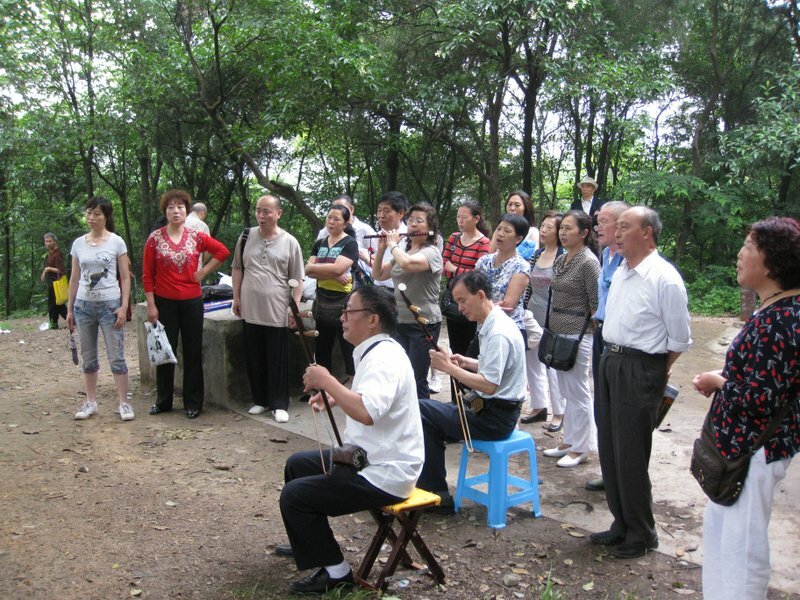 Xunyi’s mother-in-law responded that a group of old people gathered every morning in one park to sing songs from the 1960s and 70s, amid general amusement that I would be interested in such music. 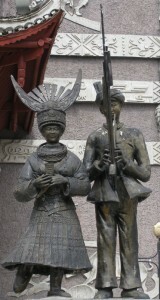 This denigration of music-making in Kaili was not confined to the three groups with whom I initially became acquainted. I also travelled around the city alone, asking all-comers where I could find musical activity. My hotel had a display list of local festival names, dates, and places, but the female receptionist flatly denied the existence of music within the city itself. My first taxi driver, a male 30-something Miao, told me that there was no music in the city, and that I should head to a more rural place like Xijiang, which had a performance every morning for visitors. A young chemist made no effort to contain her surprise at the fact that I had come to a place like Kaili to study musical activity. Being repeatedly told that Kaili had no music, and that I should look elsewhere, nearly convinced me to change my fieldwork site. However, looking over my fieldwork notes back in London, I came to realize that I had encountered all kinds of musical groups: a park choir, an amateur Peking opera troupe, itinerant street musicians, bar singers, restaurant performances, and a university music department. My failure to appreciate the accumulation of musical experiences stemmed from being constantly told that there was not much music in Kaili. I had been far more attentive to what people said than to the wider aural environment in which we were conversing. My doubts had been exacerbated by expectation. Irritated by the boosterism of cities in the post-Maoist era, I had anticipated the opportunity to contrast exoticizing representations of place with the everyday realities of amateur music-making. In this uncomplicated binary of official/unofficial culture (see Wang 2001: 3–4), inhabitants were restricted to a choice between approving or resisting the marketed image of the city. In contrast, taxi drivers, store workers, businesswomen, and conservatoire graduates were dismissive of both official and everyday music-making within the city limits, and expected me to venture further afield in pursuit of yuanshengtai. A researcher would surely be more interested in rural minority music than in what was happening in Kaili, a place which had once possessed its own antiphonal singing but was now too urbanized (chengshihua). “Music” as an object of research translated into “yuanshengtai music”, and this did not include much of what could be heard in Kaili. For those urban incidences of minority music which did exist, such as song-and-dance troupes and themed restaurants, inhabitants dismissed them as not indigenous to Kaili, and therefore not yuanshengtai. I wrote in my fieldnotes that I had gone looking for a binary but gotten a headache. It was fortunate that further fieldwork was delayed by my transfer to a new university, since this gave me time to reformulate my approach. In particular, I read literature on grounded theory, and incorporated certain aspects into my fieldwork, generally adhering to the constructivist rather than the positivist branch of this methodology (see Charmaz 2006: ch. 6 for discussion of this division). Grounded theory insists on grounding analysis in the key issues and themes that emerge during the process of fieldwork. There is no linear model of hypothesis, data collection, analysis, and write-up, but rather a cyclical process, whereby research questions are constantly being reformed by, and tested against, new data (see Glaser and Strauss 2008 ). I had not anticipated any talk of yuanshengtai outside of government circles, and initially considered it a hindrance to my study, as it went hand in hand with worrying statements about a lack of music in Kaili. I did not immediately see how the discourse of yuanshengtai related to Kaili itself. Later, I came to realize that it was untenable to simply ignore the earliest and clearest theme that had emerged from fieldwork data. I subsequently pursued the discourse during nine further months of fieldwork in Kaili during 2011 and 2012, trying to understand why citizens were talking about a music elsewhere, and what it could tell me about the city. Whereas I had expected boundaries between minzu groups in the city, it turned out that the main division pertaining to minzu – as conceptualized by fieldwork participants – was between the “fake” minorities of the city and yuanshengtai villagers. And that was to become a core chapter in my thesis, as well as an aspect of my ongoing research into Kaili. My main cause for self-rebuke was that I had not anticipated the presence of yuanshengtai as a discourse in Kaili. But then again, it was over-anticipation that had been at the root of my fieldwork confusion in the first place. Paul Kendall is a final-year PhD candidate and lecturer in Chinese Studies at the University of Westminster. His research interests include social space, music and sound, small cities, ethnicity, tourism, and authenticity. This entry was posted in Local epistemology, Research design and tagged Kaili, local epistemology, musical life, research design. Bookmark the permalink.